If you’ve always wanted a pet but don’t have the energy for a dog or the patience for a cat, you might have considered owning a turtle. Pet turtles won’t curl up at your feet at night like a dog or blindly ignore your very presence like a cat, but they are both cute and easy to care for in almost any space. Caring for a turtle requires only a little bit of effort outside of creating a healthy, water-based environment. Once you do that, your new pet could live for twenty years – or more! If you’re on the edge of investing in a pet who carries his own home around on his back or if you’re a new turtle mom hoping for some tips, you’ll find everything you need to know in our complete guide to pet turtles. For many of us, our frame of reference for turtles is a cartoon character or caricature. But in reality, turtles are a very diverse species, and many of those species make great pets. The first thing every pet lover needs to know are the differences between a turtle vs tortoise. A turtle enjoys a water habitat and loves to swim. Tortoises are land-based creatures. In the United States, the most common turtles are water turtles, particularly red-eared sliders. These little creatures grow to be almost a foot long, and people love them because they’re easy to care for – and they look just as you imagine a turtle one. The turtle you choose should depend both on personal preference and on the kind of home you can provide a turtle. If you can’t afford the space for a large terrarium, it’s better to choose a smaller turtle to ensure it has plenty of room to grow. Turtles love to swim, but you don’t need to build your turtle a dedicated pond or pool; an indoor home will do. Indoor glass homes for turtles and other reptiles are called terrariums – and when it comes to the size, bigger is always better. Turtles don’t just like to swim; they also enjoy exploring. Providing a big space for them to wander mimics their life outdoors. Although terrariums are often pictured in dark bedrooms, a room with exposure to natural sunlight is the best setting. Young turtles are still developing their shell, and they require a few rays to form properly. Turtles deprived of sunlight may wind up with metabolic bone disease, which is both painful and cuts the life of your turtle short. Some turtles, often aquatic turtles, require an additional heat source, often a UVB light. The light should be placed outside of the terrarium to block the UVB rays and simply allow the turtle to enjoy the light and heat needed outside of the water. The key to maintaining your turtle’s health and happiness in its new home is to maintain the water and the temperature. Water is the most critical factor. Turtles dirty up their water simply by living their life (or using their water as a toilet). Their water gets dirty quickly, and if it’s not changed regularly, pet turtles may get sick. Maintaining the correct temperature often depends on the individual turtle’s preferences; different species prefer different climates. In general, you’ll track two temperatures: water temperature and air temperature (for basking). When temperatures are too low, your turtle may not move around much, and they may choose not to bask, which is important for their health. Feeding a mammal is straightforward; dedicated food, twice a day and a few treats mixed in. But what do turtles eat? While tortoises are leaf eaters and prefer to snack on lettuce and other vegetables, turtles are generally carnivores. In the wild, they eat small fish and insects as well as vegetation to maintain a balanced diet. You can feed them these foods in your terrarium as well. Adding comet goldfish and other small fish to your outdoor pond is also a nice way for your turtle to hunt if you move it outdoors. If you’re looking for a simpler solution, turtle food is also available. It comes canned or in pellets and all you need to do is follow the directions. The biggest difference between pet turtles and mammals is the frequency of feeding. Turtles only need to be fed five days a week, unless your turtle is very young. A turtle wouldn’t chow down twice a day in the wild because it would have to hunt. Keeping it healthy in captivity means avoiding overfeeding him. If you’re familiar with caring for a canine or feline, you know that they require extra nutrients to care for their coats. 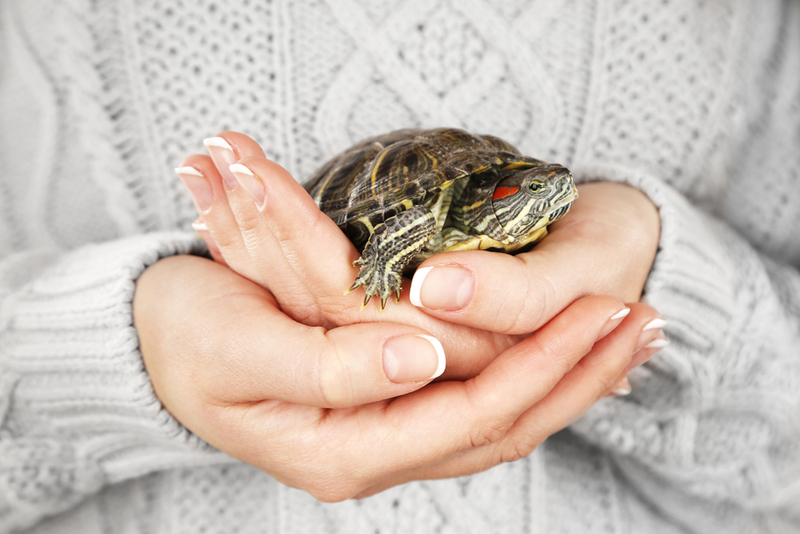 Turtles don’t have fur, but they do grow their shell, which is an indicator of your pet’s health. A health shell requires a good dose of calcium, which they may not get much of in their diet in captivity. Purchase a calcium supplement at your local pet shop or wherever you purchase your turtle’s food. Follow the directions on the packaging to give your turtle the correct dosage. Feeding your turtle a balanced diet and caring for their environment will usually ensure your pet is happy and healthy for most of its life. Most issues arise when something in their environment isn’t right and hasn’t been fixed. Still, if you purchase a baby turtle and keep it until old age, you may eventually encounter some issues. While shell issues clearly originate in the shell, abscesses, which are infected, swollen lumps, may appear anywhere on their body, often in the ears and just behind the eye. Most of the issues found in turtles, including abscesses and respiratory diseases, are related to vitamin A deficiencies. Improving their vitamin A levels requires adding some supplements to their food. If you notice your turtle acting out of character or that it has damage to its shell, it’s time to visit the vet. Can My Turtle Live Outside? Many different turtle species benefit from spending time outdoors in your pond. Still, there are several conditions required for pet turtles to see the advantages of some outside time. First, you’ll need to consider the breed of turtle and the climate they prefer. 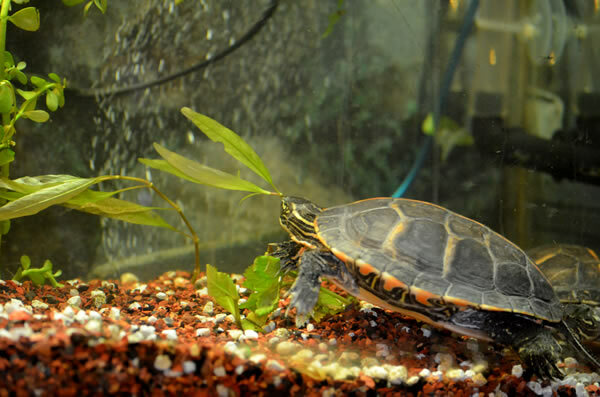 Aquatic turtles like red-eared sliders are hardy and don’t mind varying temperatures, but others may struggle to deal with cool evenings or hot summer days. Fencing is also required. Remember, your pet turtle could have been wild. Given the freedom to roam, your pet will explore its new surroundings and even go in search of a mate. The fence should be tall enough to keep your turtle in and should sink at least half a foot into the ground to prevent a buried escape. Fences also keep predators out. However, if you have young turtles or already see raccoons, foxes, and other animals on a regular basis, you may want to cover the whole of the pond area to keep these crafty creatures at bay. Finally, you’ll also need to provide a basking area for your turtle. The edge of your pond is not suitable. Ideally, it should be partially submerged, making it easy for the turtle to get some sun when its ready. Remember, your turtle’s preferences and suitability for outdoor life depends heavily on both the species and your individual turtle. Is My Child Ready for a Turtle? 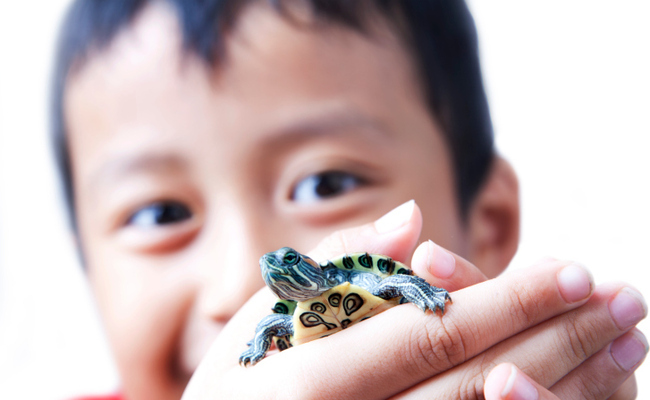 Pet turtles are popular gifts for children because they appear low maintenance for both the child and mom and dad, who take care of the pet while the child is at school or away. Although these creatures don’t require extreme amounts of care, they do require research and regular maintenance, meaning they aren’t the ideal pet for children, particularly because the terrarium must be cleaned regularly. The biggest concern to consider before buying a turtle is salmonella. It’s not uncommon for a turtle to carry salmonella, which is transmitted to humans if you’re not careful. Transmission can be limited by good hygiene and extra efforts like conditioners. However, failure to do these things may result in those handling the turtle contracting the disease, which can be serious particularly if anyone in the house is immunocompromised. Pet turtles don’t have the energy of a dog or the attitude of a cat, but they make lovely pets who require just a bit of regular maintenance. They’re hardy reptiles with the ability to live both indoors and outdoors, meaning you can have a turtle no matter where you live. A well-loved and cared for turtle can live for twenty years, meaning you’re able to grow older together. Are you a reptile lover? Share your shell stories in the comments below.